Professor Auguste A. Topaze (John Barrymore) teaches his young pupils about the moral philosophies that will make them honest and kind men. But one spoiled little rich kid, Charlemagne (Jackie Searl) doesn't want to hear it. Topaze gives him failing grades but doesn't realize what he's up against: The La Tour La Tour family. Baron Philippe (Reginald Mason) is the patriarch. He splits his time between his mansion where he lives with his neurotic wife Baroness Hortense (Jobyna Howland) and his son, the aforementioned failing student. The rest of the time he spends in his grand Art Deco apartment with his fashionable mistress Coco (Myrna Loy). When Charlemagne's tantrums leads Hortense to get Topaze fired from his job, Philippe offers Topaze a proposition. Help him create Sparkling Topaze, a tonic cure-all. Topaze takes this opportunity to use his education in chemistry for good. What he doesn't realize is that he's essentially a frontman for a money making scheme meant to fool the general public. And Topaze, enamored with Coco who quickly develops an affection for him, doesn't realize what's going on between her and Philippe. Will the morally minded Topaze's world fall apart when he learns the truth? Directed by Harry d'Abbadie d'Arrast, Topaze (1933) is half fun, half serious and all Pre-Code. The fun comes from La Tour La Tour's scheming (and let's be honest, his ridiculous name is also a factor), the Art Deco splendor and the foolish antics of the upper class. The seriousness comes from Topaze's commitment to living a transparent and moral life. We raise our fists at La Tour La Tour for trying to corrupt this gentle soul who only wants to pave the way for good in the world. The Pre-Code comes from the blatant adultery as well as from some of the sexual connotations and innuendoes. The film ends with a marquee reading Men and Women Sin, Twice Daily, with that last part blinking over and over again in neon lights. Based on a French play by Marcel Pagnol, Topaze was adapted to screen by writers Ben Hecht and Benn W. Levy. While the story is set in France and there are some references to French life, the movie has a decidedly American feel. Perhaps it's because of the political theme that runs throughout. Topaze is accused of being a Communist because of his philosophies and the Barron La Tour La Tour exemplifies Capitalistic greed. While this film comes during the Pre-Code era, it still had to be toned down. An American movie about an older man having a rather open affair with a younger woman can be excused for it's French sensibilities. Audiences could easily displace the fault to the other side of the Atlantic. The end result was saucy enough that the censors banned the film in 1936. The play was adapted to film in France in 1933, 1936 and 1951. It was also adapted in Britain as Mr. Topaze starring Peter Sellers in 1961. Topaze was produced by David O. Selznick for RKO. John Barrymore does a marvelous job as the awkward old professor with high ideals. 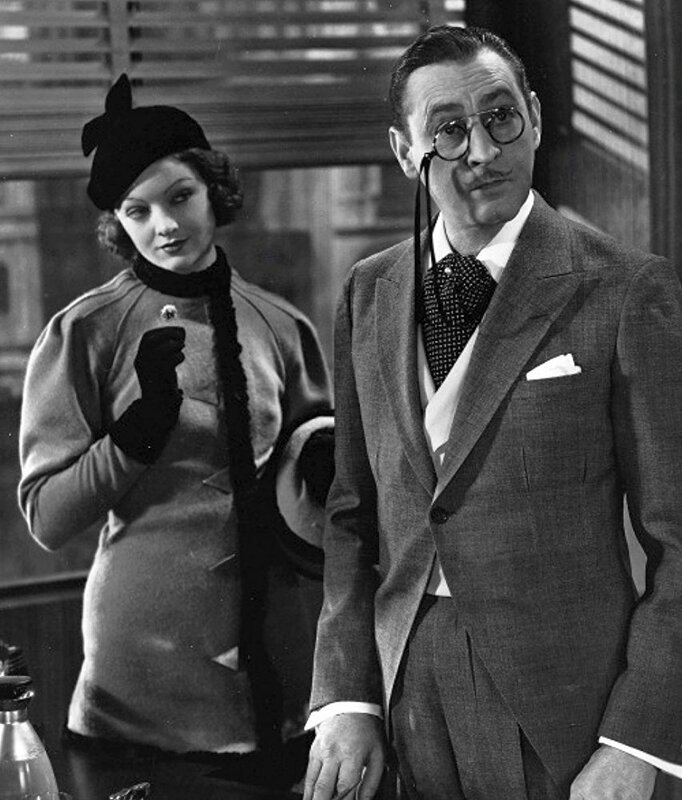 He's matched beautifully with Myrna Loy who is fabulous despite not having much to do in the film. Despite the marvelous cast, this film is so-so. I wasn't quite captivated by it as I'd hoped. It's worth seeing though for the social message but most importantly the mind-blowing Art Deco apartment that La Tour La Tour keeps with his mistress. It's a thing of beauty. It boasts the clean lines, empty white spaces and exoticism that makes me love that aesthetic so much. The apartment has circular rooms, square chairs, opulent door handles, a fire place with snake plants growing out of built-in planters, lamps with sculpted hands as the base, ridiculously narrow shelves with tiny ornaments and an Art Deco clock I wanted to steal. I was ready to pack my bags and move in. 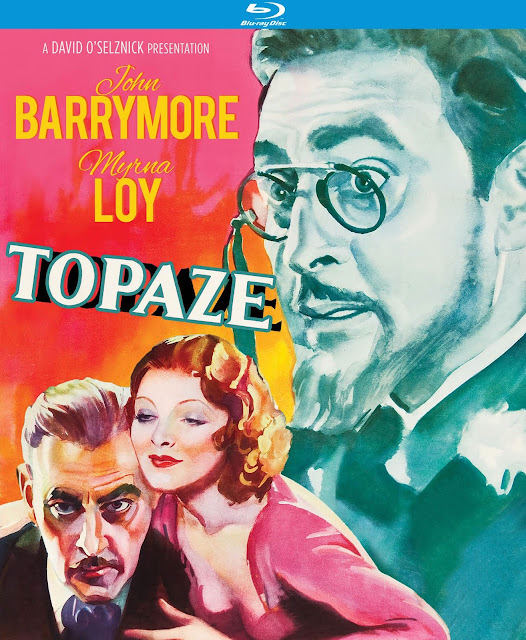 Topaze (1933) is available on Blu-Ray from Kino Lorber. The extras include commentary by Kat Ellinger and trailers from other Kino Lorber classics. There are no subtitle options for this disc. Many thanks to Kino Lorber for sending me a copy of the Blu-Ray for review!